Confessions of a Campus Missionary: Winter Camp Fun & More! Winter Camp Fun & More! These last few months have flown by so fast! I am continually amazed at how much God chooses to bless those who put their trust in him. Winter camp, staff retreat, and the beginning of the school year have all been tools God has used to show me that he is on control and just wants me to be patient. Winter camp was such a blast! (See photos below) Being on staff this year at winter camp has shown me just how much work goes into pulling off such an event. I got to work personally with the worship pastors from the other campuses as we coordinated and planned the different prasie & worship times at camp. It really encouraged me to know that God is working in the leadership at all five of our college campuses! 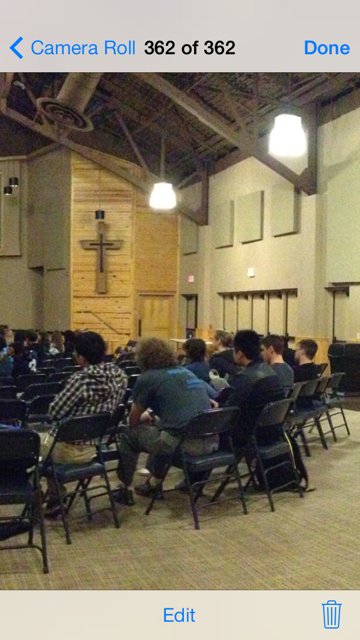 Panaroma of the winter camp group (from the back). Our students paying attention during one of Brady's talks. Brady Bobbink, a campus pastor from Washington state, came down and spoke to us on how the holy spirit brings freedom. Our community responded positively to his message and brought that same energy and dependence on the spirit back to our communities! Thank you all so much for being a part of God's vision here on his college campuses - I couldn't be a part of any of this without your support and prayer. It blows my mind that we already half-way done with the school year and God has done so much already! Thinking about what he can (and will) do for the spring semester excites me and challenges me to be faithful and alert, ready for what he has planned. Please keep us in your prayers as we select our student leadership for the fall 2014 semester. Pray that we would be discerning and faithful with what God has given us and pray for the hearts of all the students who will be stepping on his college campuses this fall who need Jesus.